I don't know if you've noticed but I tend to prepare healthy meals fairly often. This is my husband Lulu's request and it was his New Year's resolution to change his eating habits. He's lost 25 pounds so far and he's trying to get back to his pre-marriage weight. Yesterday, I boiled manicotti-like pasta (big pennoni rigati) and stuffed them with a mixture of yuba (tofu skin), green asparagus spears, yellow onions and curly parsley. After completing the vegan filling, I realized I needed a binder to be able to stuff the mixture into the cylinder-shaped pasta . While the pasta was boiling, baby Aria and I stepped outside and randomly harvested a few ripe figs in the garden. 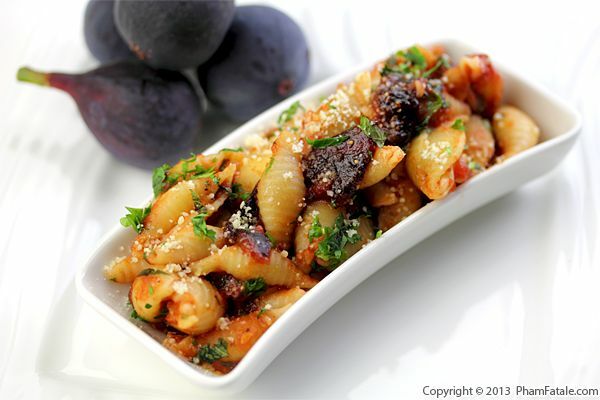 That's when I decided to prepare a sauce for this dish made of fresh figs, hazelnuts, tomato paste and roasted red bell peppers. The texture came out exactly as wonderfully as I had anticipated it would. Sometimes, improvisation ends up with beautiful results! This is my upscale version of a PB&J sandwich. Instead of using good ol' peanut butter, I used speculoos spread (fancy word for gingerbread cookie butter) and I skipped the bread and prepared blondies mixed with honey-roasted peanuts. As for the jelly part, I used a combination of crushed fresh blackberries and fig spread I prepared last Fall from the figs in our garden. Every weekend, I try to get the girls involved in the kitchen by preparing a large brunch together. It's a great way for our family to catch up with each other's busy lives. In my opinion, food is a great tool for bonding and sharing memories. 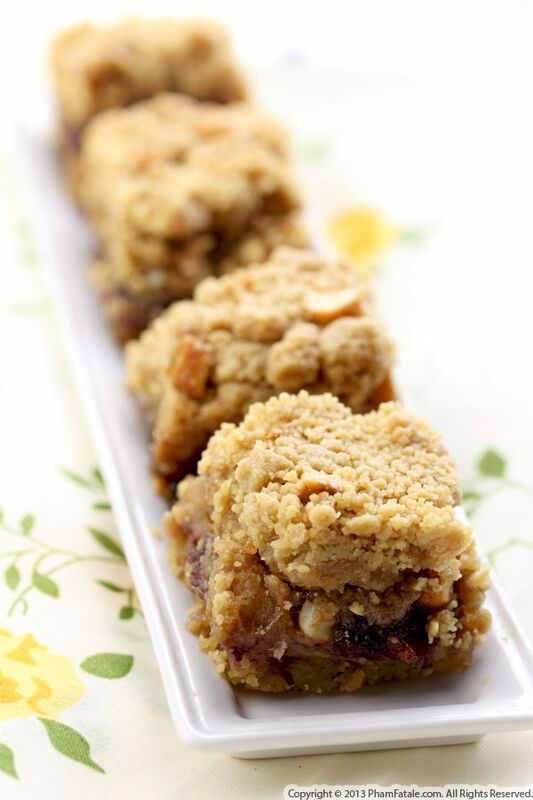 As expected, these cookie butter bars were a (fig and blackberry-flavored) smashing success (no pun intended) for both kids and grownups! I make crêpes very often. I've done it so many times since I was a kid that I bet I could prepare this batter with my eyes closed. The only difference in today’s recipe is that I made them thicker and fluffier. A crêpe soufflée is basically a regular crêpe batter folded with egg whites. This couldn't be easier! 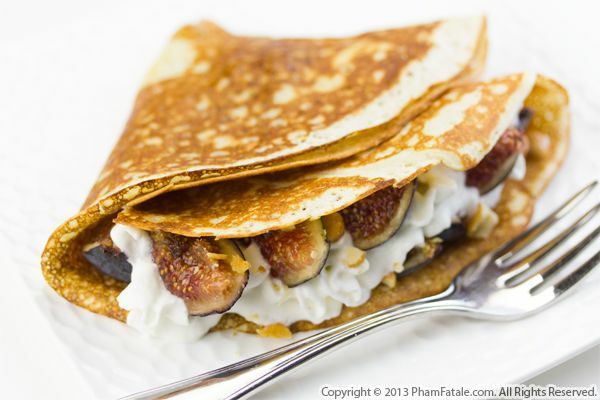 I flavored the dessert with fig spread, fresh figs and a dollop of whipped cream. To provide a great contrast of texture, I sprinkle crushed honey-roasted peanuts on top. Give this simple French sweet treat a try; I promise you'll be in heavenly dessert bliss! Lala, my husband's youngest sister, helped to maintain our vegetable and fruit garden all summer. She definitely has a green thumb and has been so good watering our tomato plants and keeping them alive (even when I was out of town for the Banh Mi book promotion in Houston last week). Lala has just started 4th grade this month. She's a very witty girl, full of energy and such a foodie. She told me she didn't want to have to eat the school lunches this year and would prefer eating homemade food for her back-to-school lunch (click on the link for more back-to-school lunch suggestions). I told her it would be possible only if she helps me in the kitchen once she's done with her homework. She started a chart with the menu of the week and she seemed so thrilled! I couldn't be more excited because these are more precious moments I get to share with my munchkin, plus it's about sharing my passion for cooking. So this evening, we gathered a few San Marzano tomatoes, basil flowers and Brown Turkey figs. You're probably wondering what we made with all these fantastic ingredients? Pasta sauce! I sweetened the tomato sauce with a hint of maple syrup and tossed medium shell pasta into the delectable sauce. 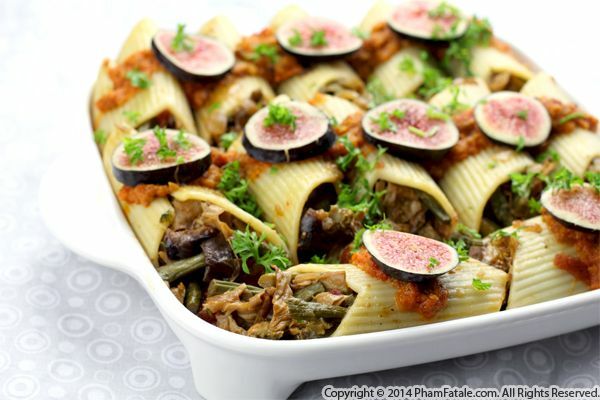 It’s sweet without being overpowering, and the figs give it a wonderful new dimension. This fruity bread dessert is so delicious you won't believe it only requires 5 ingredients. No egg, no baking time and no more than 30 minutes prep time. I cut black sesame and caraway Noor bread into small pieces and soaked them in hot fig preserves. Once the preserves were chilled, the cake jelled into one entity. I served the fig Noor bread cake with tangy crème fraîche for richness and pineapple and raspberries for a touch of acidity to balance the sweetness of the preserves. Last weekend, my good friend Laura, who's a jam expert, came over and picked 15 pounds of Black Mission figs in our garden. Aria and I helped gather as much fruit as possible so she could prepare her yummy fruit preserves. While selecting the ripe fruits, we chatted and Laura told me she would try a new technique. The idea was to find a method that doesn't require pectin. To make the preserves, Laura started by combining water and lemon juice. After bringing the liquid to a boil, she stirred in sugar and brought the temperature to 250°F. 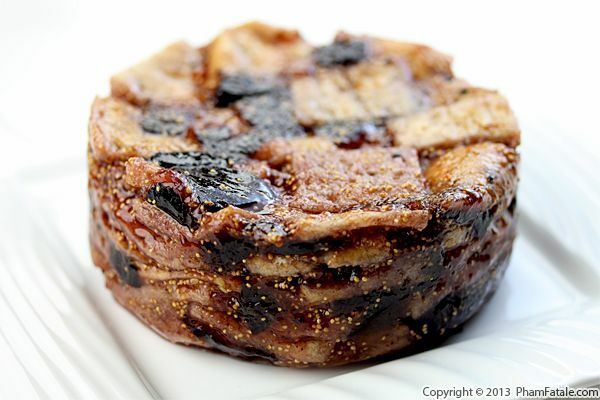 Finally, she added the figs and vanilla beans and cooked the mixture at 220 degrees until jelled. I also have an announcement for this weekend. I'm going to be making a stop in Houston, Texas for an interview with Cleverley Stone on CBS Radio 650 AM at 10am Saturday. Tune in if you can, because a lucky listener will win a free copy of my cookbooks. Then I head to Barnes & Noble to sign my just released cookbook,Banh Mi, and my previous book, Haute Potato. Make sure you stay to sample a dish featured in Banh Mi! Hope you stop by and say hi!